The children’s classic carousel, a fixture of Baltimore’s Inner Harbor for 36 years, has vanished, the victim of poor location and changing patterns of tourism and entertainment. Charm City Carousel Entertainment, which installed the latest animal menagerie merry-go-round, removed the structure earlier this month, leaving an empty wood-chipped circle where rain was pooling this morning. Laurie Schwartz, president of the Waterfront Partnership, confirmed that the attraction was unable to lure enough customers to survive. She said its location, sandwiched between the Maryland Science Center and Rash Field on the harbor’s under-utilized south side, has always been a drawback. The Baltimore Development Corp. agreed to terminate the carousel’s lease eight months early (it was due to expire on December 31, with two five-year renewal options) upon the company’s payment of $13,750 in back rent. The city has “no plans” to seek another operator at the site, BDC spokeswoman Susan Yum said today. Describing a carousel as an “appropriate and desirable use to have at the harbor,” Schwartz said there has been talk of relocating the ride to the West Shore Park near the Walter Sondheim Fountain. 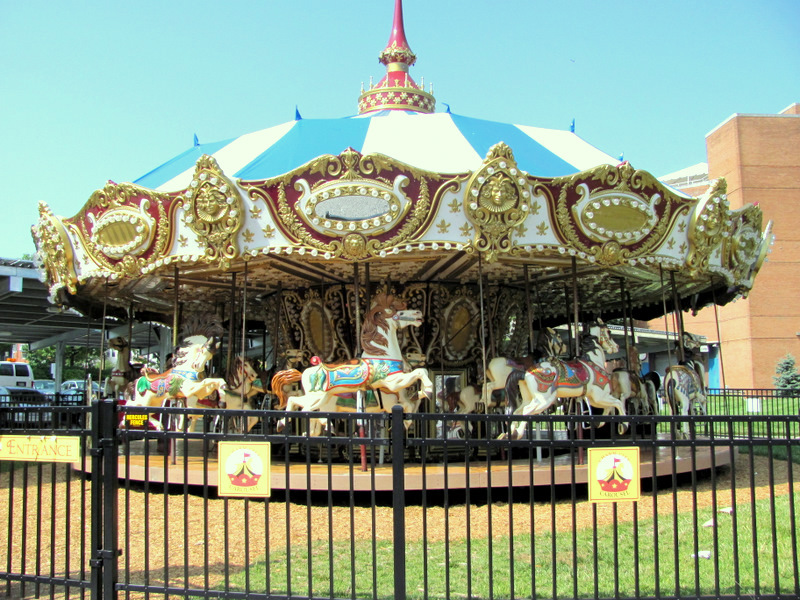 The carousel was the brainchild of former Mayor William Donald Schaefer, who wanted family-oriented entertainment at his newly-created Inner Harbor. In 1981, an antique Herschell Spillman merry-go-round was installed at the site. For a number of years, the ride was a hit with children and parents, earning its operator, Richard H. Knight, $100,000 in gross annual revenues. By 2010, however, the ride was generating less than $25,000 a year, and the wooden structure had badly deteriorated. The city said Knight wasn’t paying his rent, and Knight said the city wouldn’t let him upgrade or sell food. After the carousel was removed, the BDC and Waterfront Partnership considered other attractions for the site, including a rock climbing wall, zip lines and a 200-foot observation wheel, before settling back on the carousel idea. Almost from the start, however, the new merry-go-round – garnished with 30 animal figures and two chariots – failed to attract crowds. Less than a year after it opened, the Board of Estimates agreed to slash the carousel’s annual rent from $50,000 to $10,000 (higher if certain revenue goals were hit). Those revenue goals apparently were never reached, and the operator soon got behind on rent payments. Mark Rosenzweig, who operated the carousel for Ride Entertainment of Stevensville, Md., released a statement today to The Brew calling it “an honor to bring the magic of a classic carousel to Baltimore visitors from all over the world” and said it was a pleasure collaborating with the BDC and the Waterfront Partnership. 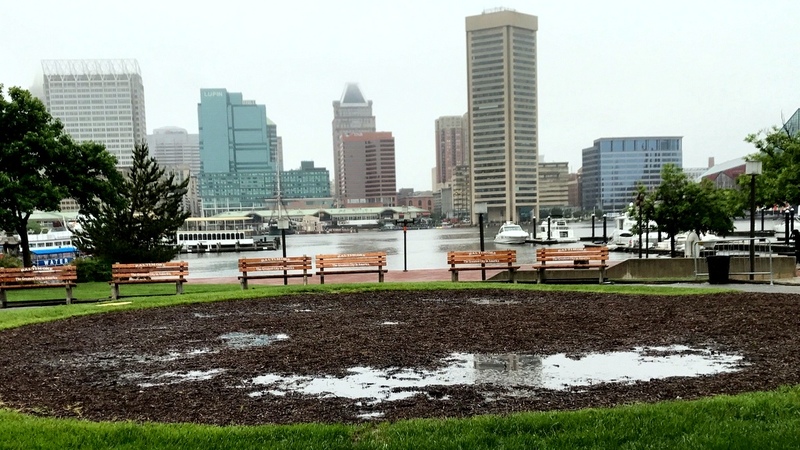 “We hope that there will be an opportunity to do so again in the future as the development of the Inner Harbor evolves,” Rosenzweig said. Both Schwartz and Yum threw cold water on that idea. The carousel site is expected to remain vacant until it is incorporated into the planned remake of Rash Field into a children’s nature area and small skatepark, Schwartz said.